In honor of this lovely day, I'm giving my top eleven favorite things about Fall! 2. Scarves and sweaters ~ I adore Fall clothes, enough said! 3. Hot tea ~ I drink hot tea year round, but there's something about the chilly months, a cup of tea and a cozy blanket that gets me everytime! 4. Apple Hill ~ An annual tradition in Northern Cali. 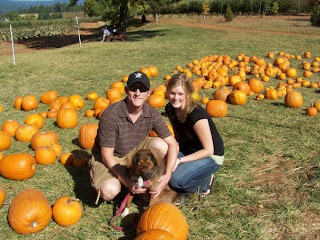 Miles and miles of apple orchards filled with fun festivities, a pumpkin patch, apple treats and a craft fair! 5. Hearty produce ~ My favorites are butternut squash and eggplant! 7. October ~ My second favorite month and the official month of Breast Cancer Awareness! 8. The colors ~ Deep plums, reds, burnt oranges...some of my favorite color combos show up all over the place in late September and October! In fact, our apartment kind of flowed right into Fall with our colors! 9. Soup ~ Since I can remember, I have always loved soup! And a plus, you can pack such nutritionally dense ingredients into them. Clean Eating magazine comes out with some amazing recipes! 10. Christmas music ~ I'm not gonna lie to you, by the time October gets here, I am itching to listen to it and almost always give in! What am I saying, I ALWAYS give in!! 11. Chris and I have started a new tradition of flying to the Mid-west to visit my Dad, Step-Mom and siblings in the Fall. We are totally looking forward to our trip next month! Last year at Apple Hill! All of the same reasons for me! Plus I got married in October! Autumn sunsets at the beach are nothing short of amazing!!! aww very nice! i love all those things too!